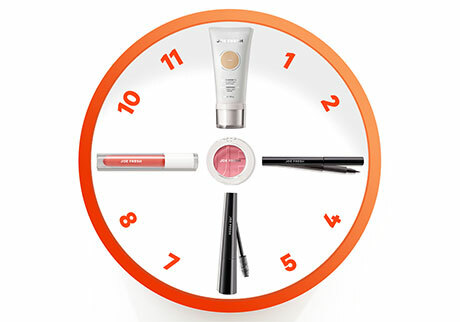 Joe Fresh introduces The Five Minute Face—a fast, effective system to make your daily beauty routine shine in less time. We like to think Joe Fresh makes getting dressed each morning fun, easy and stylish. When it comes to beauty, we thought, “Why should it be any different?” That’s why we created The 5 Minute Face—a quick and simple beauty regimen that can be achieved in less time than it takes to brew your morning coffee. Now get your timer and follow these five easy steps to put your best face forward—all while spending less time in front of a mirror and more time doing the things that matter. Evening out the complexion is the basis of the 5 Minute Face. With four foundations to choose from, you can easily find your ideal amount of coverage. The Sheer Tint, for example, is a lightweight tinted moisturizer that’s oil-free and creates a natural finish. Choose a silky powder blush in shades that range from peach to pinks, with finishes from matte to shimmery. With a blush for any skin tone, you can find the ideal shade to add warmth and colour to your cheekbones. Add definition to your eyes with eyeliner. Whether you like a smooth application that twists up (say goodbye to sharpening!) or the look of liquid liner, we’ve got you covered. Volume? Check. Lengthen? Check. Define? Check. Enhance your eyes with rich mascara that adds just the right amount of drama to your look. We think lips are the place to experiment and have a little fun. From glosses to lipsticks in cream, matte or sheer, Joe Fresh has a range of finishes, textures and colour intensities for any mood. Depending on your preference, layer your lips with a luscious, bold color or a light, moisturizing tint. That’s it! Now your coffee is almost ready and so are you. So go out and conquer your day with confidence.